Shearwater Journeys is pleased to have you join us on our exciting nature trips to observe some of the most fascinating wildlife found in the Monterey Bay area. Please read the following information carefully as it will add to the enjoyment of your trip. DEPARTURE Please go to the dock on CHRIS FISHING SHOP on FISHERMANS' WHARF at 7:00 a.m. where they will direct you to the boat for boarding and the pre-trip briefing. Please be PROMPT. The boat will NOT wait for latecomers. The boat will return at approximately 3 to 3:30 p.m. Allow for delays of several hours in returning to the dock if unusual wildlife is encountered. WARM CLOTHING should be brought in large quantities, including rain gear, headwear, gloves, and non-skid shoes or boots. Persons in open-toed shoes will not be admitted to the boat. A large man's handkerchief is good for wiping spray from glasses. The boat will go out in rain or small craft warnings, at the captain's discretion, so be prepared. Ponchos must be secured about the waist with a belt. Bring sunscreen. It can be cool at any time of the year, including summer, on the ocean. SNACKS are NOT available, as there is no GALLEY on board. Bring an ample supply of food, crackers, and liquids. CAMERAS and BINOCULARS are essential, however telescopes, tripods, folding chairs or stools, are not permitted on board. Bring plastic bags to protect your equipment from spray. Bring field guides, too! Shearwater Journeys cannot be liable for loss or damage to your personal property while on the trip. SEASICK PILLS are highly recommended and, to be effective, they must be taken one hour PRIOR to boarding. If you have never taken them, check with your doctor first. There is no need to be embarrassed about this common problem, but it does require your attention. The best cure for seasickness is prevention. If you take anti-seasickness medicine, be sure to read the warning labels on the package. Eat a non-greasy, high protein breakfast (a full stomach is less likely to betray you). Do not drink alcoholic beverages the night before the trip. Pretzels and carbonated beverages during the trips can be helpful to settle your stomach. Avoid the use of colognes and perfumes. Go to bed early. The number one cause of seasickness is lack of sleep. Remember, the key to avoiding seasickness is to take preventive measures PRIOR to your trip. WEATHER is rarely a problem inside sheltered Monterey Bay. If it is raining, do NOT assume the trip will be cancelled. Please do not call me or the shop because the weather can change drastically overnight. We do not make decisions regarding cancellation until the morning of the trip. Sometimes, the winds kick up in the afternoon forcing an early return. (The trip will be deemed completed.) Occasionally, we might have to cancel at the dock, if the weather starts to deteriorate rapidly. You may reschedule your trip or request a full refund within 30 days should Shearwater Journeys cancel the trip at the dock. Only one trip in a thousand fall trips (July through October) has been cancelled due to weather. REFUNDS can be made ONLY if Shearwater Journeys is notified in writing THIRTY (30) DAYS before your trip, using the postmark of your letter as the date of the cancellation. NO REFUND WILL BE MADE FOR ANY REASON SHOULD YOU CANCEL YOUR RESERVATION AFTER THE THIRTY DAY CUT-OFF PERIOD! There are NO exceptions to this policy. You must cancel in writing as answering machines, and email are unreliable. If you cancel your reservation thirty days before your trip, you will receive a refund in 30 days. There is a $20 processing fee for EACH canceled reservation. You may reschedule (switch to another date) on another trip 30 days in advance in writing. There is a $20 rescheduling fee. Trips may be canceled by Shearwater Journeys, Inc. due to undersubscription, hazardous weather conditions or Acts of God. If the trip is canceled due to weather or terrorists, by the captain you will receive a refund, less a $10 processing fee, within 30 days. In no event, however shall our liability exceed the obligation to refund more than the amount you paid to us. If you should miss your trip due to airline changes, cancellations, terrorist acts, acts of war, or related incidents, your fee will not be refundable unless Shearwater Journeys, Inc. cancels the entire trip. See your travel agent for trip cancellation insurance which we highly recommend purchasing. COURSE ALTERATIONS may be necessary if SIGNIFICANT marine bird, mammal, fish, or turtle events occur on the day of your trip. This may involve spending more time in one area, or prolonging the length of the entire trip. This is a judgement call on the part of Debra Shearwater or any of the Shearwater Journeys' leaders. Examples of past significant events include orcas attacking gray whales, orcas on an elephant seal kill with attending storm-petrels, unusual humpback whale behavior repertoires, or events that require photo-documentation. Reports of extremely rare birds (Streaked Shearwater, Red-footed Booby) from other vessels have resulted in fast paced chases. Shearwater Journeys' trips are marine natural history trips with a strong focus on seabirds and whales, dolphins, and porpoises. SAFETY reasons prevent pregnant women from being admitted to the boat. The facilities cannot accommodate wheelchairs. Also, please consult with me before making a reservation for anyone under 12 years of age. SMOKING is NOT permitted on the boat. This is for everyone's comfort. To improve the quality of your pelagic trip, we request that you please turn off CELL PHONES and pagers while on the boat. Soliciting of any sort is not permitted without the expressed permission of Debra Shearwater. MOTELS in the surrounding area can be very expensive. It is wise to reserve motels months in advance as the peninsula can be very busy any weekend of the year. It is possible to arrive and find all motels fully booked. Camping facilities are very limited. Contact www.montereyinfo.org for help with reservations. PARKING in the public parking lot near the wharf is best, however, this area is very confusing and it is best to allow ample time or to scope it out the day prior to the trip. From Del Monte Avenue, turn right on Washington Street into the main parking lot. Take a ticket upon entering, get a validation sticker from CHRIS' FISHING SHOP, and it will cost $3-4 upon exiting the lot. Be aware that there are two different wharfs and don't get confused with the commercial wharf. Receipt of this contract acknowledges your acceptance of the above conditions. The leaders and Shearwater Journeys assume no responsibility for personal injury. Very often we find that birders expect to find all of the pelagic birds possible for the season on ONE trip (and even some not expected at a given season)! Remember that you will be looking for migratory birds and each day is very different. Think of your favorite landbirding place in migration - you would probably spend more than one day birding such an area. High Island, TX and Cape May, NJ come to mind. Seabirding is no different in this respect. 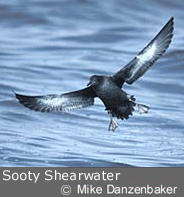 Seabirding is one of the most difficult types of birding that there is, given the conditions of boat motion, salt spray, etc. Most folks who come from out-of-state participate in more than one trip, thereby maximizing the outcome. Remember, these trips include ALL marine life! Often, the best birds show up while we are watching whales. Come well-rested and be prepared for excitement!